Today began the official National Letter of Intent (NLI) signing period for men’s soccer. At Gill, three seniors on the varsity boys’ soccer team gathered in Brueckner Hall to sign NLIs: Max Aunger, Steven Bednarsky and Anes Mrkulic. The three plan to continue their soccer careers with NCAA Division I schools next fall, heading to Boston University, Lehigh University and Monmouth University, respectively. Coaches, friends, family, the head of school and members of the athletics department were on hand this morning to watch the signings and offer congratulations. During their time with the varsity soccer program at Gill, the team garnered state championships in 2013 and 2016. Aunger (Boston University) was a three-year varsity starter at Gill, opting to spend his senior season training with Red Bulls Academy. He finished out 2015 with four goals and 12 assists. Bednarsky (Lehigh University) capped off his career as the Knights’ center midfielder with a slew of post-season honors, including 2016 Courier News Player of the Year, Skyland Conference Player of the year and the designation of first team All-State, All-Conference, Somerset County and All-Prep. A powerful offensive player, Mrkulic (Monmouth University), amassed 54 goals and 26 assists during his four years on the team. Post season honors from 2016 included designations of All-State, and first team all Prep-B and All-Conference. 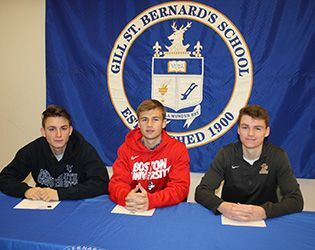 Head Coach Tony Bednarsky said "It was a proud day for GSB soccer, with three excellent players signing letters of intent for Division I programs. In addition, Cam Miller will be playing soccer and baseball at Muhlenberg College next year and Kevin Brito will be playing soccer for Stevens Institute of Technology. To have five scholar-athletes going on to play for top-flight soccer programs says a lot about our school and our soccer program." Congratulations to these and all of our athletes. Go Knights!